Over the past few weeks, I found myself on a parallel path with Mike Wolff. He was doing a giveaway offer for his books, I was playing my part as Inklings Press was doing a giveaway for Tales From The Tavern. We retweeted him, he retweeted us, I picked up his books, he picked up ours. Chatting over Twitter as the promotions went on, we set up the Q&A he did with us yesterday, and he was kind enough to review Tavern over on his blog. I say this because in the world of self-publishing and self-promotion, that kind of mutual internet fist bumping and wishing one another well is kind of the way things work - you see people who are going about their business in a way you respect, and you tip your hat at them along the way. I suspect Amazon ends up ruling that as review swapping but no matter, this review comes not because of any review elsewhere, but just because Twisted Tales is a very fine read indeed. There are five stories in Twisted Tales, all dancing along the edge of horror and fantasy. Reviewing short story collections is inevitably going to end up with a mixed bag of impressions, simply because some stories you will like more than others, but there's some very strong writing in Twisted Tales. The standouts are The Caretaker, a grimly dark tale of bloodshed in a small town, and the enduring love that goes with it; The Killing Fog, and the short story that feels like it's bursting to become a novel, Phosphenes. That latter story really does feel very much in Stephen King territory, akin to the likes of Under The Dome. Townsfolk are haunted by flashes of light behind their eyes as they try to sleep, the phosphenes of the title, making them restless and leading to deaths on the roads as people fall asleep while driving. Worse, the phosphenes start to resolve into visions... which begin to spell out a terrible fate for everyone in the town. Dealing with issues such as faith, betrayal, the inability of authority to cope in the face of the unthinkable, the story packs a lot in. The Killing Fog, too, feels like it exists as part of a larger landscape. It's a fantasy story yet picks up on themes such as domestic abuse, and the world Mike Wolff paints feels like it is more substantial than the deadly fog that paws at the windows of its protagonists. 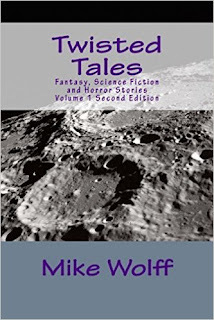 The anthology is rounded out by a quick shiver of a story, A Web Of Lies, and Rise Of The Dragons, which is plainly a piece of fun and a bit of an in-joke for members of a writing group Mike Wolff belongs to. Think of that latter one as a bonus piece to the compilation, while the rest is a solid selection. Putting on my critical hat, the collection could do with a slightly tighter edit, particularly on the design side in the author's notes section, where it could do with an extra page break or two and a little duplication on the copyright note removed. However, that really is just picking at small details that have nothing to do with the enjoyment of the stories. Twisted Tales is available on Amazon here.